Maurice Sendak didn’t set out to make children happy. What he did was draw classic books that perfectly captured what it meant to be a young child. And thus, by merry serendipity, did he make children (and grown men) happy. Now, marking the 50th anniversary of Where the Wild Things Are, you can see 50 of Sendak’s original illustrations, many previously unseen, in Maurice Sendak: 50 Years, 50 Works, 50 Reasons, at the Bowers Museum in Santa Ana. Max and Carol fill the walls. 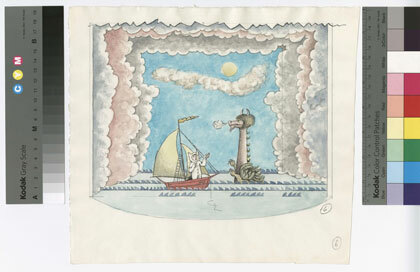 As do Sendak’s images for set designs that he made for operas, including Oliver Knussen’s operatic adaptation of Wild Things. Sendak’s commissioned work is on display, along with eight images of Macbeth that he drew for his high school teacher so he wouldn’t fail English (visit our gallery). Celebrity readings are scheduled for the first week in April to coincide with spring break (schedule TBD). So you can take your children to hear it. Or just your inner child.